What options does India have? A week has passed since ten desperadoes, allegedly from across the border, took a billion Indians by surprise. For 59 hours they kept us on our toes leaving behind a trail of physical and emotional agony. Terror attacks had been occurring at an alarming frequency this year but this turned out to be the 'Father of All'. We saw the western media covering it extensively while the Indian media made the best of it, their TRP's indeed soaring high. People wanted the government to hold someone accountable within its fraternity who could not prevent this abhorable act from occurring. Top ministers had to loose their job and well, rightly so. Now with all this commotion over, its the time to bring the culprits to justice. Accusations are intensifying across the border and with India receiving substantial international support this time around, the hitherto 'soft' government of ours is finally 'hardening' its stand. War is what many Indians want as evident from the media coverage. However, is War the solution to this problem or in itself harbinger of a much bigger problem. I believe its time this War rhetoric ends and the Indian media act responsibly(definitely a tall task for them) refraining from fuelling these sentiments of the people. People are angry, its true. But this anger should be diverted towards forcing the government to first set our house right. There are abundant lacunaes in our intelligence and internal security establishment which need to be filled. By engaging in war-mongering, we are deviating from our priorities and allowing the government to get off lightly. The government will engage in brinkmanship and then apply the reverse gear(they will be having no better option- we might just see another Operation Parakaram). The clouds of war will pass by and we'll eventually forget that there is a lot of work to be done at home too. Don't waste this opportunity. 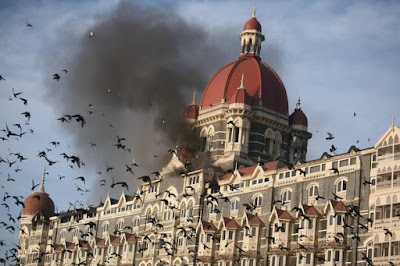 To prevent another 26/11, we have to strengthen our country from within. We need a Federal Investigation Agency, laws to strengthen its capabilities, better internal security arrangements in form of more NSG battalions stationed in all metropolitans, securing our hotels, cinemas, market places and other public places and most importantly not allowing our land to crop up terrorism in name of religion. Mumbai attack may have diverted our attention from Delhi and Malegaon blasts which were orchestrated by Indian fundamentalists. Lets first uproot them from our soil and when all of us are integrated(in practical and not utopian sense), then march towards those who dare to raise their eyes on our motherland.